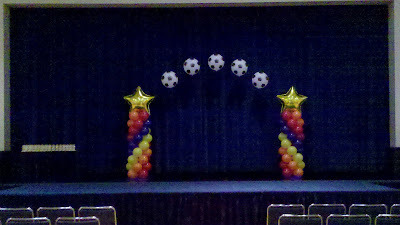 Colorful columns with Stars on top and Soccer Ball Arch creates a fun spot for photos on the stage as HPN Allstars Soccer wraps up for the summer. Call 863-255-2025 to order decor for your Awards event. Based in Lakeland Florida Party People Celebration company travels Central Florida to set up events.